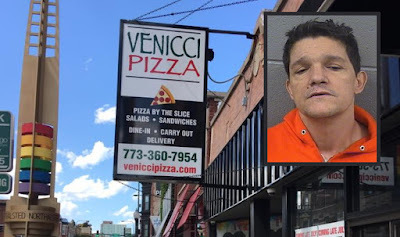 Philip Kordowski is convicted of burglarizing Venicci Pizza. A 52-year-old career burglar has been handed another 14-year sentence for a restaurant burglary in the Boystown neighborhood during the winter of 2017. 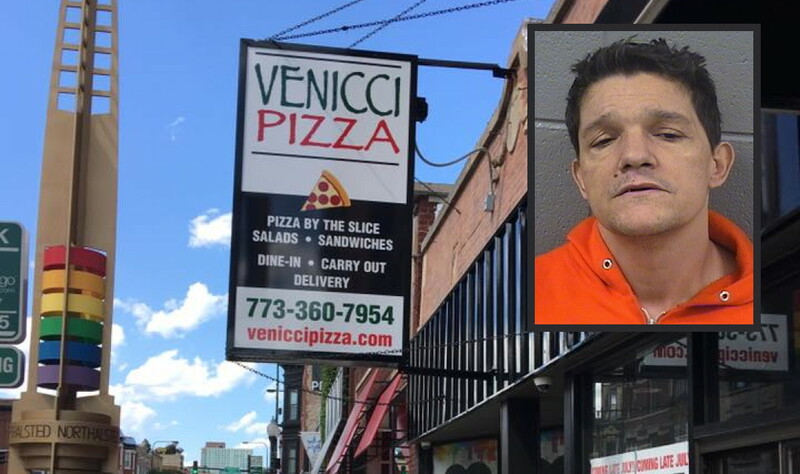 Philip Kordowski pleaded guilty to burglarizing the now-shuttered Venicci Pizza at 3343 North Halsted on March 4, 2017. Judge Stanley Sacks ordered him to serve at least 85% of his fourteen year sentence with credit for 560 days time served awaiting the outcome of the case. Police said Kordowski was also suspected of burglarizing several businesses on Broadway in Boystown, too, including 44th Ward Alderman Tom Tunney’s Ann Sather restaurant, Revolucion Steakhouse, and a liquor store. Cops set up surveillance on Kordowski’s home in the 500 block of West Hawthorne Place and took him into custody as he walked his roommate’s dog. When cops went to return the dog to Kordowski’s roommate, they saw a gray sweatshirt with the words “The night is dark and full of terror” written on the back lying on a chair. Video images from the pizza burglary showed the offender wearing an identical sweatshirt, prosecutors said. Gerald Harris, a convicted burglar who continues to receive kid glove treatment despite his failure to correct his own behavior, has been sentenced to three years for burglarizing a 68-year-old Wrigleyville woman’s garage in March. But, in the usual “slap-on-the-wrist” treatment that Harris has grown accustomed to, Judge Nicholas Ford agreed to recommend that Harris receive a lesser sentence of bootcamp. Harris, 32, was on parole for attempted burglary at the time of the break-in. Despite the fact that the burglary was a direct violation of the terms of his release, the Illinois Department of Corrections refused to revoke his parole. One month before he broke into the woman’s garage in March, Harris was charged with stealing a power tool set from the Center on Halsted, 3656 North Halsted. But the Center failed to show up in court, and the charge against Harris was dropped. One week later, prosecutors took the unusual step of filing a motion to reinstate the Center on Halsted charges because the Center said they were given the wrong court date. Judge Anthony Calabrese agreed to reinstate the case. The charges were dropped for good when the Center failed to appear on the new date. On March 21, Harris was accused of repeatedly beating a business owner in the face after the victim confronted him about throwing garbage in front of his shop in the 4500 block of North Ravenswood. Harris was charged with battery and fly dumping before being released on a recognizance bond. His parole was again not revoked and he didn’t even appear before a judge to have bail set. A suburban man who was accused of falsely claiming that a group of black men beat him up near Wrigley Field in May has received a sentence of 20 hours of community service. Dustin Garza, 36, told police that he had been battered by a group of black men—one of whom displayed a gun following a Cubs-White Sox game, according to a police department report. Garza's claims were “revealed to be false" when police reviewed footage of nearby surveillance cameras, an officer wrote. No motive was given for the alleged false report. Police said Garza had $2 in his pocket when he was arrested. Miguel Yanez, a serial thief from the Ravenswood neighborhood, has pleaded guilty to stealing a $1,800 octopus sculpture from an art school near his home. Yanez received two-years of mental health probation from Judge Lauren Edidin. In June, 41-year-old Yanez was arrested after he stole a bike at North Avenue Beach and then tried to sell it to passers-by, according to a police report. One week after stealing the octopus art, Yanez was accused of stealing a power washer from the same art school. In February 2016, Yanez was sentenced to two year's probation after he pleaded guilty to shoplifting $680 in merchandise from the now-closed Sears store in Portage Park. Three South Side residents have been sentenced for their roles in a series of robberies around Lincoln Park and Lakeview in October 2017. The crew was charged with robbing a 24-year-old woman in the 600 block of West Wrightwood; a 45-year-old woman in the vestibule of her building in 400 block of West Aldine; and a 20-year-old woman in the 500 block of West Surf. Breann Taylor, 20, who was on electronic monitoring at the time of her arrest, has been sentenced to three concurrent six-year terms. Her parole date is set for November 24, 2020. Keontae Hollins, 20, was sentenced to three concurrent terms of five and has a parole date of June 1, 2020. Thomas Wilson, 33, was given two years of “intensive probation” for using the victims’ credit cards after the robberies. Judge James Obbish approved all three plea bargains. Deontae Hollins, 20, previously pleaded guilty and was sentenced to three concurrent five-year prison terms. His parole date is set for May 22, 2020.